Includes two male end fittings and two tapered heads. Includes a Duct Rodder Repair Kit. 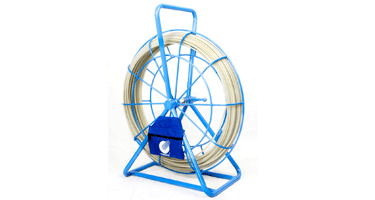 The Mini Cobra duct rodder is composed of a glass reinforced composite core jacketed in a rugged plastic coating to ensure long life. 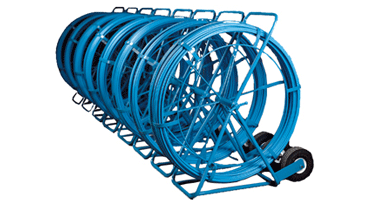 They have favorable electrical and thermal properties that make them safe for use in cable occupied ducts. Since 1980, Jameson's Buddy System of rodders and fish tapes have evolved to become the most comprehensive in the industry. Click here for all Buddy versions including the Easy Buddy, Good Buddy, Big Buddy and Mega Buddy. Connecting a signal transmitter to the Duct Hunter™ energizes the unit with a specific frequency. When the energized Duct Hunter™ rod is pushed into underground pipe, the signal radiates outward through the soil to the surface. A signal receiver detects the frequency applied to the Duct Hunter™, allowing the entire buried utility pipe to be traced and marked continuously from above ground by one man without digging. Connecting a signal transmitter to the Duct Hunter™ energizes the unit with a specific frequency. 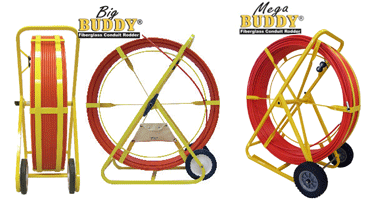 When the energized Duct Hunter™ rod is pushed into pipe, the signal radiates outward to the surface. A signal receiver detects the frequency applied to the Duct Hunter™ , allowing the pipe to be traced inside walls, floors or underground.